Be informed when new artworks from your favourite artists are added! Please enter your E-mail below. I had bought this little book of "Once upon a time in China and America" with lots of pictures, and that photo struck me. We could really see his face very closely, and since his face fascinates me so much... I decided to choose that one. There are not so many good-quality photos of Jet where we can see him closely, and i know that now i have to search directly in the movies. But that's right because every time i see a movie, some very precise pictures remain in my mind. I know exactly which picture I NEED to draw one day. Which angles, and so on. I've already some ideas for next drawings... So, i started to draw him. I always use charcoal pencils mixed with classic pencils. It's very helpful to restitute the texture. And what interests me is precisely the texture. It's sensual... i need to feel the volumes, the softness of skin, ... portraits are very special experiences, different from drawing comic characters, for example. You have a particular "contact" with your model, different from the one you have with a character you create. Both portraits and comic characters are fantastic to do. During every drawing i make, i'm listening to some music. 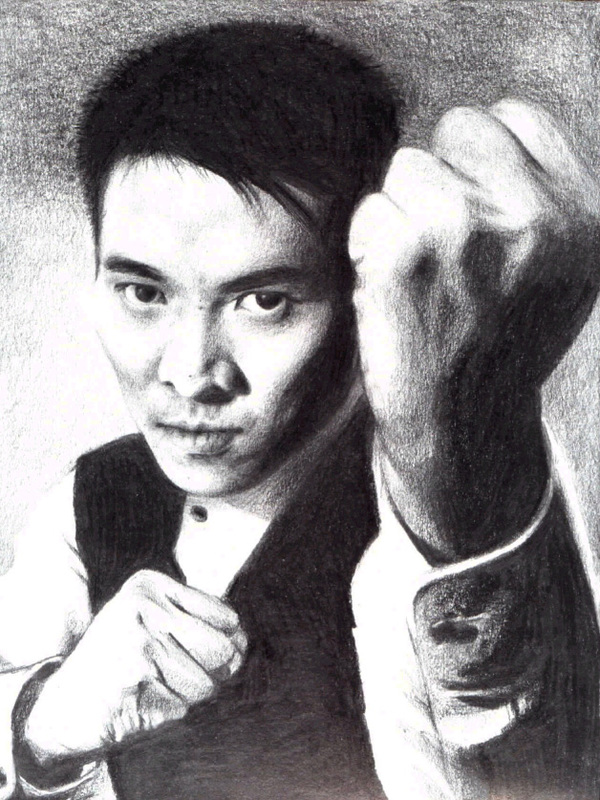 And there's always a special song associated to one special drawing... strangely i'm always listening to quiet and serene musics while drawing Jet Li. For the last one, it was the very beautiful beginning of a Smashing Pumpkins song, "Porcelina of the vast oceans". This beginning was 2'12 long, but never mind, i put it in repetition to keep this appropriate atmosphere. And this drawing was only finished a long time after it was almost complete, because I always saw something wrong in it. My sister Elodie and my brother Antoine were of great help to make me realize some little incoherences. We often need some external look since we are so implicated : in the end, we can't see the existing defaults anymore. So others or just time passing help a lot. I didn't look at it for a few weeks, and after that i was able to finish it. 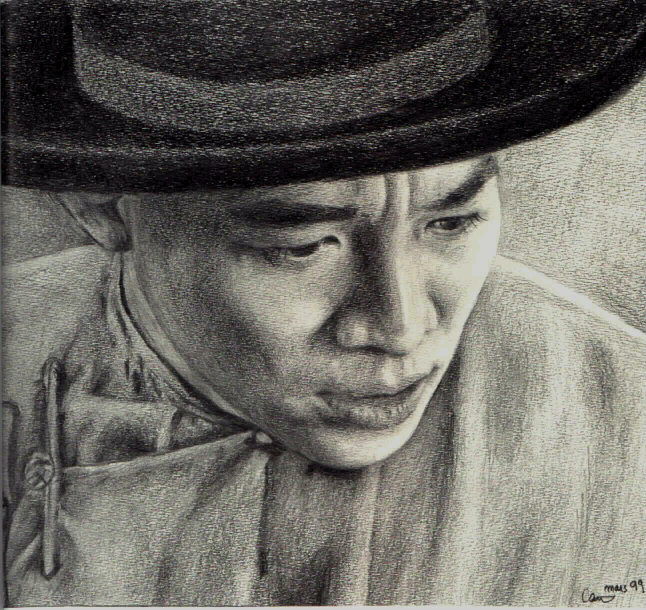 I made this drawing during the Summer 1998, when I had only been knowing this actor for several months. So this can be considered as a first approach todraw him. It's always better to knowvery well (artistically speaking, of course) the person you are drawing, and I can't say that it was the case here, but I tried to restitute what I had perceived at the time. I chose this picture because I loved the contrasts of the photo, which are always very stimulating to draw. I also liked the proud look on his face, and I wanted to be faithful to this impression. I used several kind of pencils to create the depth of the face and the complicated levels of shadows. 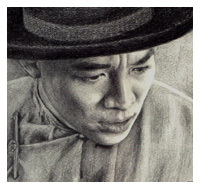 I rearranged it one last time for Jet Li's birthday, and it took me some time, since I have the habit to draw faces longer than they are in reality. It was quite a challenge because the paper had already been damaged a little : I had been pressing a lot on it with my dark pencils and erasing a lot too!